It’s Christmas time for motorcycle gear-heads. Tis the season for new releases. New for Fall 2013, Joe Rocket introduces the Ballistic Revolution Jacket. If you experience true winters with rain, sleet, snow, and cold temperatures, Joe Rocket wants you to unwrap the Ballistic Revolution Jacket. If you’re in sunny California and ride year round in perfect weather...no one is talking to you (please excuse my jealousy)! Ballistic Revolution? Did Joe Rocket go off the deep end? Are they starting a Revolution? I am not convinced. For those of us who are familiar with Joe Rocket gear, we know they favor comfort by making relaxed cut garments. 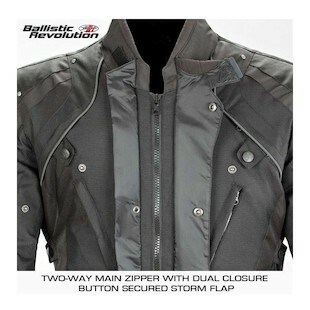 So, when I tell you the new Joe Rocket Ballistic Revolution Jacket has a ton of adjustability for multiple body types….no surprises there. In addition to comfort, Joe Rocket went above and beyond with protection. The first line of protection is the outer shell. If you enjoy riding with waterproof and abrasion resistant outer shells, you’ve hit the jackpot. It’s nice when you don’t have to take on 50 lbs of water before your waterproof liner kicks in. In the name of protection, I am pleased to announce the Ballistic Revolution incorporates a full sleeve removable thermal liner for those chilly days when you’re happily commuting in sub-freezing conditions. Damn you Californians! Last but not least, we cannot forget the staple features like CE rated armor and reflectivity. 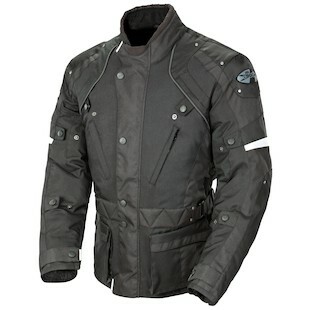 The Ballistic Revolution jacket will have you prepped for 12 rounds of hard fought riding. Watchout mother nature!